LAS VEGAS, November 9, 2018	(Newswire.com) - LAS VEGAS, November 9, 2018 (Newswire) - According to SmartAsset, Henderson is ranked as the number one city retirees are choosing to move to. This ranking was created based on the official immigration data provided by the US Census Bureau, according to which the city of Henderson has a net migration of 2,341. To dive into the numbers more specifically, a total of 3,191 people over the age of 60 recently moved to Henderson, while only 850 moved out. These statistics prove that Henderson is indeed a popular choice for retirees when it comes to finding a permanent home. 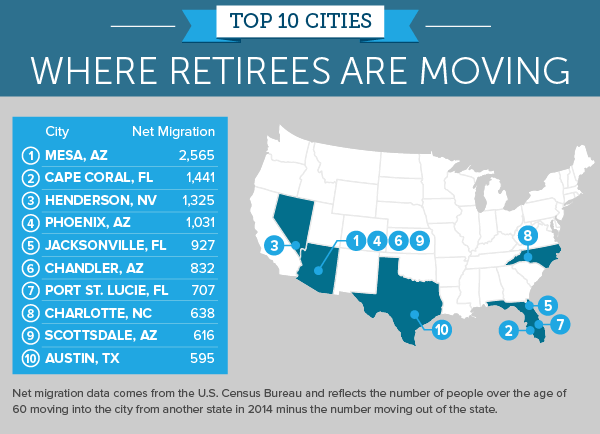 When it comes to the top states for retirees, SmartAsset ranked Las Vegas, Nevada as #5. The reason why Nevada and the city of Henderson are so attractive to the older population is because there are no income taxes in this area. Besides, the suitable costs of living along with a variety of programs and amenities designed for retirees make Henderson such an attractive destination for the 55+ population. Located in the Mojave Desert of Southern Nevada, Henderson is one of the most desired cities to live in for multiple reasons, including the variety of amenities, affordable housing options, and beautiful landscapes and communities. However, this city is much more than an ordinary location in Nevada characterized by stunning master-planned communities. In fact, Henderson has recently joined many lists of top places for retirees in the United States. According to Great Retirement Spots, the city of Henderson has boomed by 300 percent within the last decade. The current population of the city counts around 290,000 people, while 34 percent of those people are over the age of 45. William Margita, a local real estate agent with Urban Nest Realty, says, “While Henderson has several 55+ Sun City active adult communities like Anthem, it’s the Henderson townhomes that are in demand.” Margita cites the single story, low maintenance, townhomes or ground level condos as the most requested by incoming retirees. He adds, “They are looking for something with the least amount of responsibility that they can also lock and leave if they choose to travel.” Henderson is located very close to the center of Las Vegas, as well as other famous attractions such as the Hoover Dam and Lake Mead. The suitable weather in the area is perfect for older residents who want to spend as much time outdoors as possible. The mild weather in the winter allows for many outdoor activities that aim to maintain optimal health and well-being. Henderson features several 55+ communities that are specifically designed for the older population. These communities offer enhanced security, affordable yet comfortable housing, as well as a variety of facilities and amenities targeting this specific group of people. Another reason why many retirees choose to move to Henderson is because of the variety of activities the area has to offer. With a total of 41 parks, 65 miles of walking and biking trails, and 8 world-class golf courses, Henderson is a heaven for those who are looking for healthy activities and entertainment. Besides featuring many great outdoor amenities, Henderson is also home to one of the largest malls in the state of Nevada, the Galleria at Sunset mall that features 130 stores. Other features responsible for the number one spot on the list of top places for retirees include state-of-the-art medical centers such as the St. Rose Dominican Hospital, as well as events such as The Country Fresh Farmer’s Market that takes place every Thursday and Friday. Experts at SmartAsset are not the only ones who ranked Henderson as one of the top places for retirees to move to in the U.S. CNBC has also confirmed that the city of Henderson is one of the most suitable locations for retirees because of the lack of income taxes and a variety of programs made for people over the age of 55. The city of Las Vegas is also ranked quite high on the list, even though not higher than Henderson. However, considering that Henderson is in close proximity to the center of Las Vegas, the residents of the city can take advantage of all Las Vegas amenities. While CNBC and SmartAsset calculated their lists according to the immigration data, Forbes focused the financial data provided by the Census Bureau. According to this data, the average income in the United States equals to $57,617. The data provided by the United States Department of Labor, a recent Consumer Expenditure Survey showed that people in the U.S. spend an average of $57,311 per year. As you can tell, the gap between the two numbers is way too low, meaning that people with an average income can barely enjoy a good quality of life in some areas of the States. Those who make below average per year are at an even worse position. Forbes used this data to create a list of places where people can comfortably live with an average income of $60,000 or less per year. The city of Las Vegas, including the area around it, is ranked #6, while the income one needs in order to live comfortably in this area equals to $56,609 per year. Las Vegas also appeared on Business Insider where it was given a score of 55.22 out of 100, as one of the most affordable places that offer excellent healthcare for retirees. Business Insider also ranked Las Vegas the 17th out of 150 cities for best amenities. When it comes to affordability, the city is ranked #32, for healthcare #109, and for quality of life at #52. All these high ranked amenities of Las Vegas are located close to the city of Henderson, meaning that the residents of Henderson and it’s communities can enjoy in the benefits as well. Besides, Henderson itself packs a variety of facilities and amenities that are more than enough to attract thousands of retirees each year. Most importantly, the city has very low crime rates and offers affordable property pricing, along with other benefits such as a variety of different communities and opportunities to meet new people and enjoy a positive life.